Watch hundreds of videos produced by Jim Blasingame. Receive new videos as they are released by pointing your newsreader to our videos RSS feed. Jim Blasingame gives four examples of how small businesses cam learn from big business mistakes. After his keynote at 2018 NSCA Business & Leadership Conference, "Age of the Customer" author Jim Blasingame sat with AVI-SPL senior VP of sales Dale Bottcher to talk about how to re-prioritize selling processes. Did you know that just being competitive in the market isn't enough anymore? If prospective customers don't know what we have to offer then we are not relevant. Jim's book, The Age of the Customer: Prepare for the Moment of Relevance, can help entrepreneurs stand out and stay relevant during this shifting paradigm from a sellers market to a customer driven market. How do you define success and happiness? 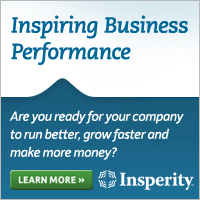 Extreme commitment to your small business can sometimes have devastating results. Understanding how do balance life outside the business will not only help you find happiness, but it will also help your small business succeed, explains Small Business Advocate Jim Blasingame. Make your next event even better with a special keynote by The Small Business Advocate® and The Age of the Customer® author Jim Blasingame! Jim Blasingame shares his 2013 predictions about what will happen with the economy and trending topics. Jim Blasingame explains why intangible assets are important for your IP strategy. 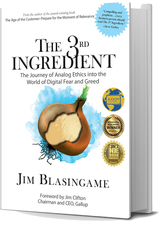 Jim Blasingame lists "Blasingame’s Three Cs of Business Storytelling" to help grow your small business. Jim Blasingame talks about gun control within small business.